Have a One Week Free Trial on us and Give Mozzies The Flick! Tired of swatting pesky mosquitoes? Kids constantly scratching and complaining of bites? Mozzy killer that is guaranteed to work or your money back. All you do is pay a small deposit on delivery, test it for a week and for any reason at all, it you are not completely satisfied, you get a complete refund of your deposit. Call us today on 0417 251 911 while this offer lasts and mention that you saw us on Hills District Mums. Mosquitoes are well known as pests around the world that spread diseases and cause itchiness. Getting rid of mozzies is much easier than you may know; here’s some tips to help you keep them well away from you and your family or staff. Dump or flush out any stagnant water sources in your yard. Examples of mosquito breeding grounds include old tyres, driveway puddles, unfiltered fish ponds, empty flowerpots, and any item that can hold water for more than a few days at a time. If you have mosquitoes or other stinging insects such as gnats in large numbers, then don’t try and get rid of them yourself. You need a professional solution that is also completely environmentally friendly. The Terminator uses UV Light, a Heat generator, constantly flowing CO2 and air suction to trap and lure flying pests. • The energy efficient long life UV Tubes (3000 hours approximately) produce an irresistible light source. • A large concaved heating surface means the trap is slightly warmed to simulate the temperature of human skin. 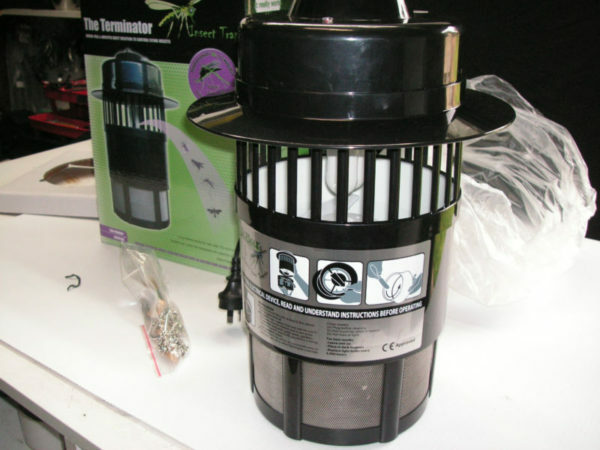 • It has a powerful suction fan which has the ability to draw insects down into the collection chamber with no mess or spills. • It attracts annoying insects either during the day or night-time due to advanced CO2 Technology. 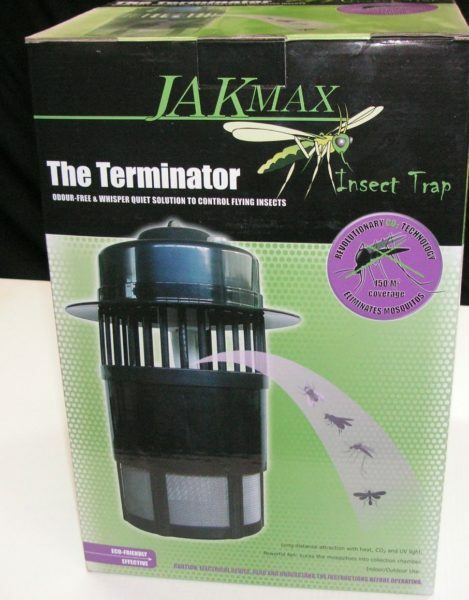 The JAK Max “Terminator” Mozzie Trap controls biting insects such as Mosquitoes, Sand Flies, Midges etc, indoors or in exterior areas. Its Photocell technology automatically turns it on at night-time so you will always have protection from those pesky flying insect pests. The photocell switch may also be set continuously for all day 24 hour usage. By cleverly producing CO2 that mimics animals, the Black Hole mozzie trap traps and lures all mosquitoes, and can also catch and kill other pesky flying insects like flies and even moths which may be attracted by its black light. 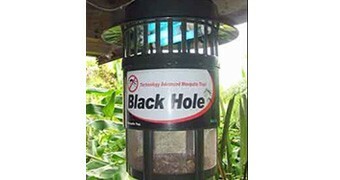 Black Hole Mosquito Traps are a safe, effective, environmentally friendly alternative to normal pest treatments. They may be positioned inside or to the exteriors of homes, gardens, offices, swimming pools and barbeque areas. Best effective area: sixty-six to one hundred and sixty-five square metres. The light globes lasts for over three hundred hours, & are available from most lighting shops. The Black Hole is available in Sydney Metropolitan area, just ring us on 0417 251 911 & order one over the phone. You’ll find heaps of forum entries like the above, but in my experience, DIY efforts on how to get rid of mosquitos are generally a waste of your time, because they just don’t work! The Only Good Mosquito is a dead one!! !